I didn't want to end our study without giving you a few traditionally feminine examples. Consider these ideas the finishing touches of our Ladies' Finishing School lesson! 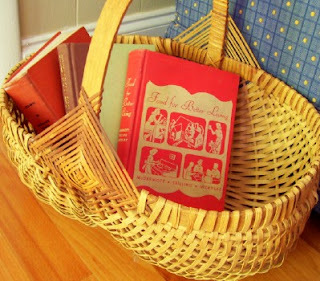 Pile the week's cookbooks in a basket and sit outdoors for menu planning while the children play. Find all the baskets you could ever want at yard sales. Prop open a pretty book for decoration. Wooden display stands are easy to pick up for $1 or less. 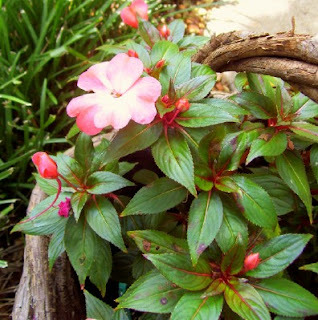 Disguise a plastic pot with a damaged basket for a more natural look. This one came from the curb. Line a bin with an old tea towel or napkin. Spots don't matter when only the edge shows. 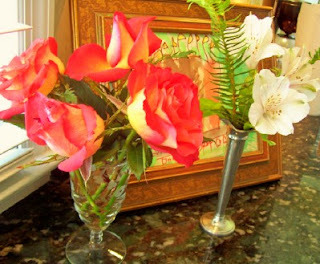 Stretch the life of an aging bouquet by separating and cutting the stems into new containers. 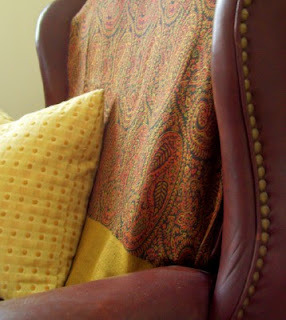 Cover the torn back of a chair with a neatly tucked throw or hemmed fabric remnant. Paisley is always handsome against leather. 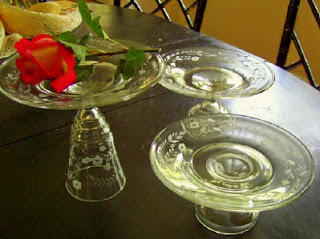 Transform your odd stemmed glasses into pedestal serving pieces. China works well, but glass is prettiest. Use double-sided clear tape, sticky putty, or a piece of rubber rug gripper to secure the plate to the glass. I have soooo enjoyed this series, and I am so glad to have found you again. What a wonderful blog! You are so talented and inspiring. 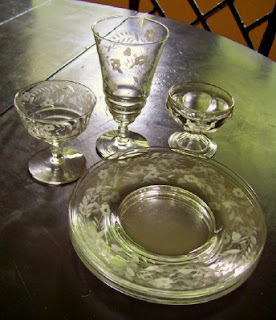 I love the idea for pedestal serving dishes. Thanks for all of the inspiration you've provided this week. I agree, I love the cake plate idea, and have soooo enjoyed the series, thank you so much! Your ideas as always are wonderful. I think you could give Martha Stewart a good run for the money. Your ideas are so fresh and thoughtful. Thank you for sharing the ideas with us. I love the last one! :) Such a fantastic idea! Thank you for all of your work on these posts, I have SO enjoyed them and have been re-inspired to beautify my home in simple and lovely ways! I just found your blog last week and have thoroughly enjoyed the "Living Well on Less" posts. However, I find that I feel overwhelmed just keeping up with the essentials, let alone setting a really pretty table (and making more dishes to wash using serving pieces) or things like that. My children are 6, 3, and almost 1 and another is due in January. We do try to live quite frugally, but shopping with all three I find it much harder to thrift-shop then when I could go alone. Have you ever been in this position and if so, could you tell me how you got past it and to where you are now, with all the pretty finishing touches? I just wanted to say thanks for the inspiration (again!) Your ideas have helped me look around the house and see what I can re-use to change my living room to match the season. I love decorating with books! 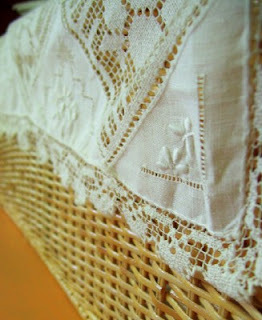 It's such an easy, inexpensive and beautiful way to enhance a room. 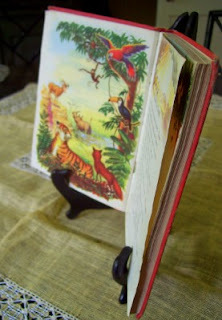 Beautifully illustrated classics can be found super-cheap at thrift stores, too.